Employment offer letter is the primary way to create a healthy employment relation with a positive note. If you search online, you will find many Offer Acceptance Letter Samples that are generally used by employees as a reference when they receive an employment letter. However, as an employer, it is your responsibility to create a meaningful offer letter that has a direct tone and is positive as well. Surf for some interesting sample employment offer letters and draft the one for your employees by which they should feel that they are chosen because of their experience and skills which can help your company grow. 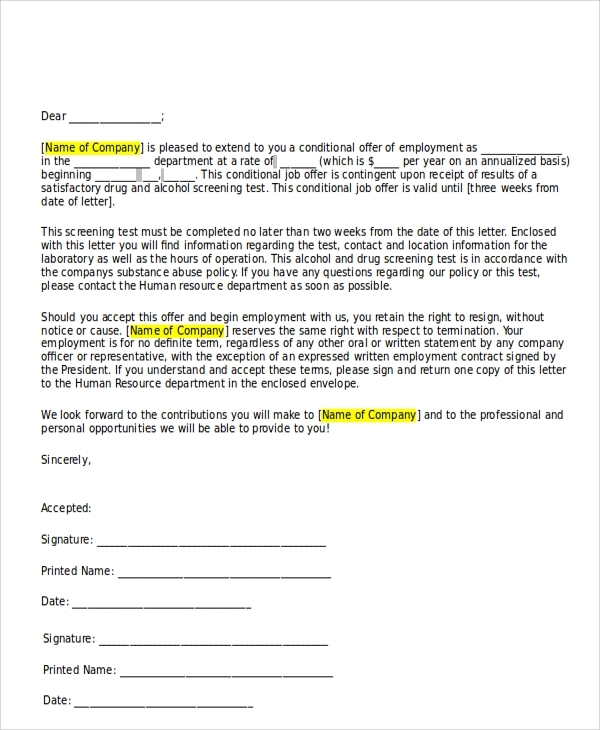 This type of offer letter is a simple way of letting an employee know that he has been selected for a particular role of the company. 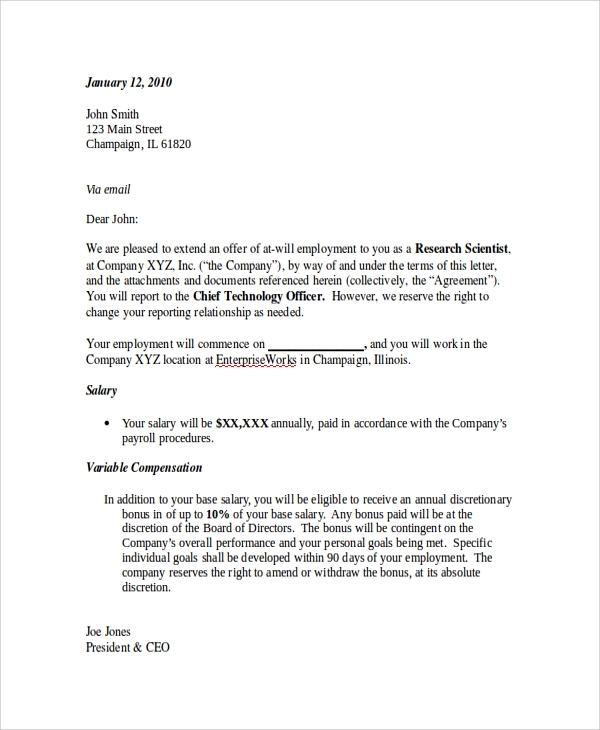 This offer letter has important information like perks, employee benefits, salary, date and time of the document made, and company responsibilities to name a few. This type of offer letter is given to the employee stating a particular time span till which the person is hired. It could be a time of probation or the time till which the company decides, but generally, such type of offer can be up to a maximum of 2 years. In case the employee’s performance impress the company, his offer letter can turn into a permanent one. 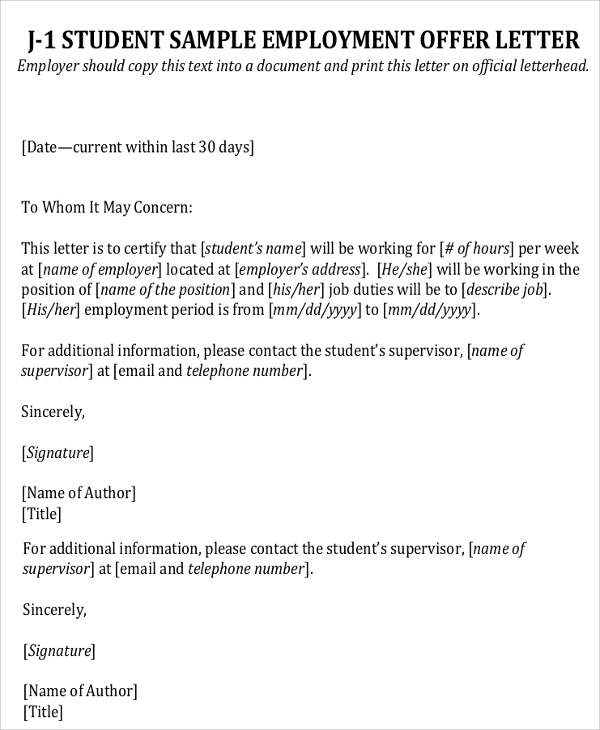 This type of formal letter is a job offer which depends on the employee successfully clearing certain tests of assessment and fulfilling the conditions. The job offered to the employee turns out to be permanent only if the conditions are successfully met. The letter of offer of employment is a legal document which an employee can use as a source to create a career in the company. 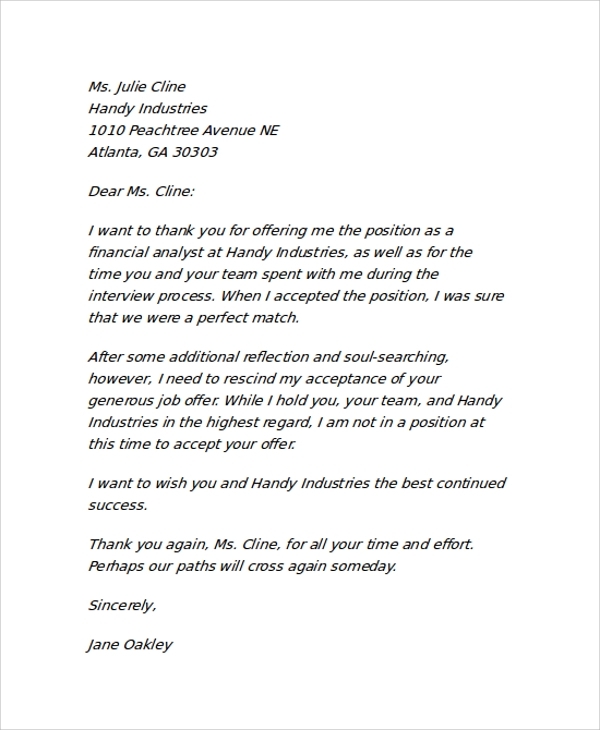 This type of letter helps the employee understand his roles and responsibilities towards the company. It also helps the employer to create particular rules for the employee. It should be used when you hire someone and want to make a formal offer of employment. It is also considered as a starting point of negotiation which later can be amended and then a final letter be drafted with the consent of the employee and the employer before resuming the job. 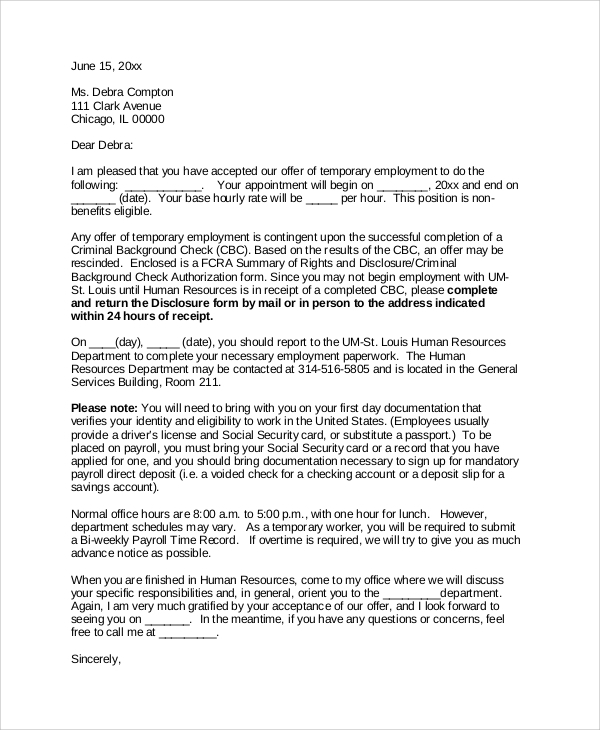 what is the need of Employment Offer Letter? 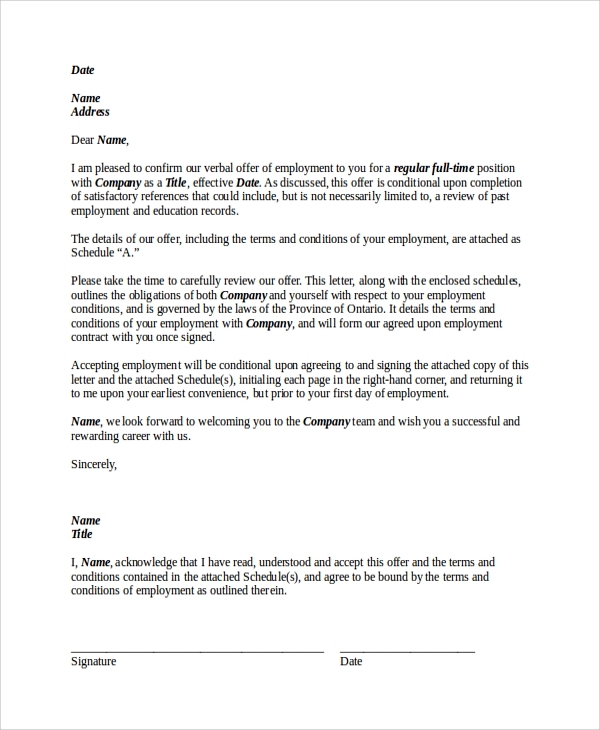 This type of letter is a legal agreement between the employee and the employer stating the new course of employment which would be starting between the two parties. The employer needs to send one copy to the employee with duly signed to ensure that the terms mentioned in the document are acceptable to the candidate. On the other hand, the employee needs to revert the same with his/her own signature as a sign of acceptance. 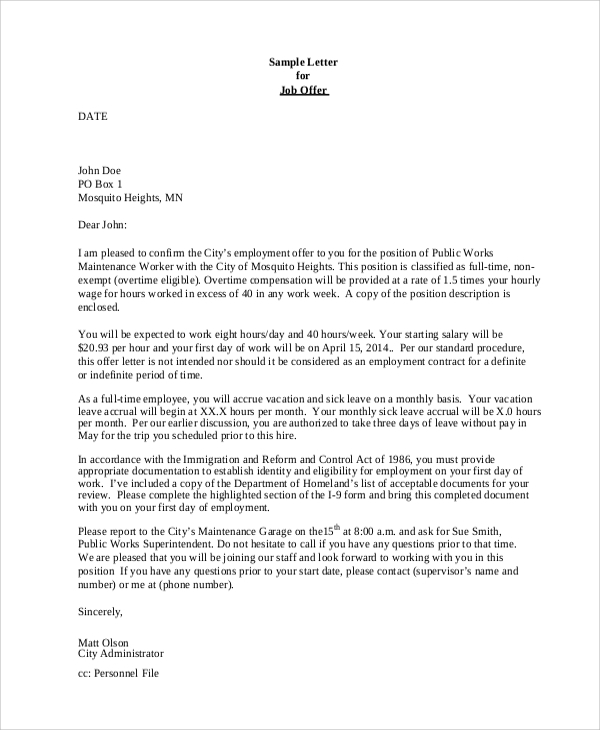 This type of letter is required for any business, company or outlet which is planning to hire a bunch of employees who would be working under them. The letter outlines the roles and responsibility along with the necessary details of the company. 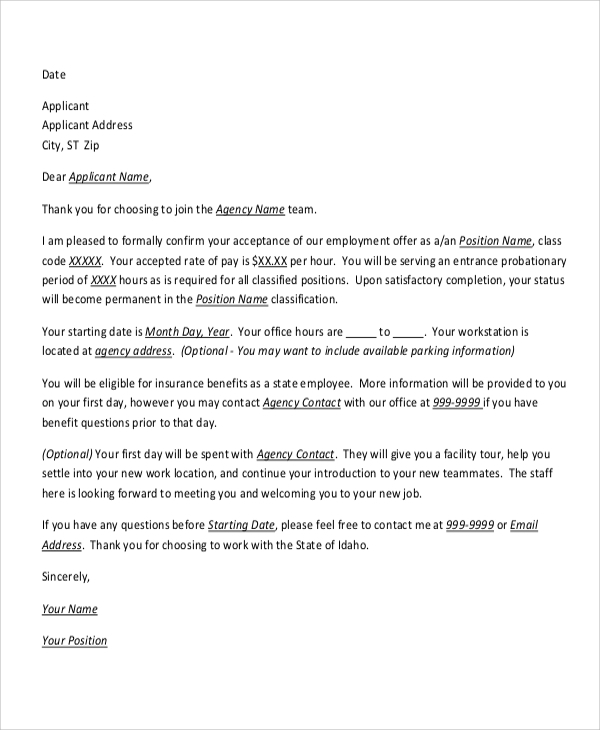 How to create/write a Sample employment Offer Letter? Never take any offer letter lightly because it serves as a legal document for hiring an employee. Before you send a Job Offer Letter to the selected candidate, you need to understand the content which needs to be put on the letter. It is necessary to create such legally binding document carefully to make sure that your employee is satisfied with the terms that you have put. There are some important things that need to be included in the letter such as the starting salary which will be offered to the employee and details like frequency and mode of payment. The perks and benefits of the employee should also be clearly mentioned. The length of probation or working with company needs to be specified and if there are any relevant documents expected by the employees to sign, it needs to be mentioned in the document. There are different rules and ways of writing an offer letter. 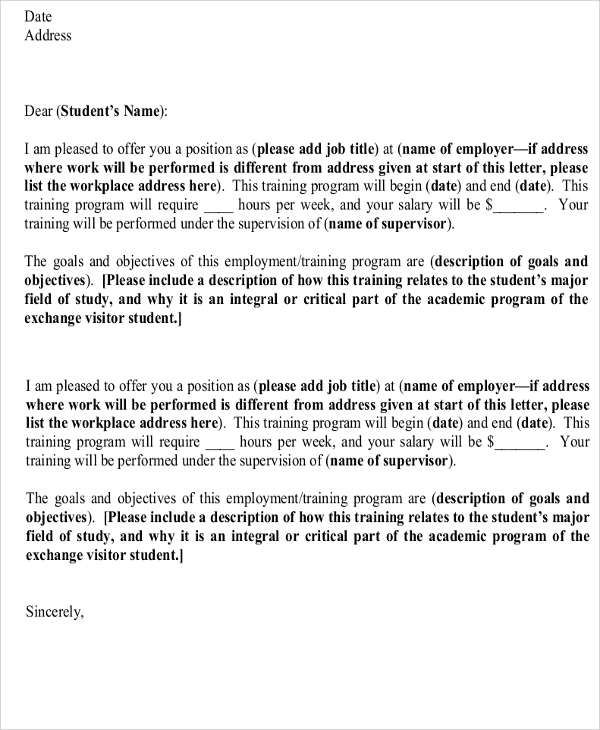 You can refer to Internship Offer Letter Sample and understand the difference. It is better to make such documents under the guidance of an HR or a legal heir who is well versed with the process.